Drawn together by shared concern for a beloved elderly friend, they must step out of the past’s shadow to save her and her home. … But that shadow could blight their love a second time. Can a little girl and an old woman help them absolve old sins and build a future? The side door of the First Church of Tobias, Wisconsin emitted a high-pitched protest at being opened, but other than fleeting surprise that anything dared make such a noise in such a place, Annette paid no attention. She had other things on her mind. Right now. To Steve Corbett. The man who’d said he wanted to be with her more than anything else. The man who’d withdrawn into abstraction and politeness in recent weeks. The man—according to dark whispers she’d overheard—who’d been having intense conversations with his former girlfriend, the one from the perfect background for a Corbett. Gossip. That’s all. From people who couldn’t believe the elder Corbett son would really marry Annette Trevetti. Couldn’t believe it even after the church was booked and the invitations went out. She’d once been among the nonbelievers. For a full year, she’d insisted they were dating casually, even though she’d lost her heart to him. Now it was their wedding. The happiest day of her life. After all, as she’d been told over and over, this was the wedding of the century in Tobias. The music, flowers, dress, and ceremony were exquisitely tasteful. Even the bridal party was selected for balance and proportion, which was why, she’d been told, her brother couldn’t be in it—he didn’t fit. “That’s crazy,” she’d blurted in front of the wedding consultant. Her mother-in-law-to-be, Lana, had stiffened with disapproval at the breach of decorum. How could she both admire his calm and hate it? No, not hate it. Not understand it. That’s all. When later had come, Steve had said he would make sure Max was in the wedding—over his mother’s objections and Max’s refusal to wear a tux—if that was what Annette wanted. Tuxes wouldn’t be an issue at all if the wedding were the simple, personal ceremony she’d thought they both wanted. She’d kept hoping Steve would stand up for their plan. 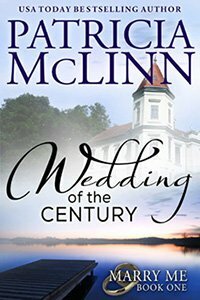 But he’d become so distracted she doubted he even noticed what the wedding had become. Then he’d taken her in his arms and said what mattered was the two of them spending the rest of their lives together. How could she argue? And how could she push him toward another family fight when she knew—thanks to the Tobias rumor mill—he was defying his mother by marrying her at all? So Lana Corbett decided every detail of the wedding. After all, everyone in Tobias knew Annette, poor all her life and motherless the past seven years, didn’t have the faintest idea how to pull off a wedding worthy of a Corbett. What if the wedding said something about the rest of their lives together? “I do!” came from the vicinity of the side door. Despite gasps from the guests and the minister. Annette didn’t turn—she was busy being grateful Lana couldn’t blame this wrinkle in the master plan on her. Concern trickled up her spine, though, when the corner of her eye caught Max half rising, his face set in protective-big-brother lines. All at once, that all-wrong “I do” hit home. She turned and saw Lily Wilbanks with her hands spread across a notably rounded abdomen. Gasps turned to outcries. Distantly, Annette heard a voice demand that someone remove that woman. Lily had to be wrong. Mistaken. It couldn’t be Steve’s baby. The rumors. Steve and Lily, sitting in his car at Lake Tobias Park, heads close, faces intent. It was the same soothing tone Steve had used over losing control of the wedding—their wedding, the start of their marriage. It held calming sympathy, but even more it held the Corbett proceed-with-dignity warning. Not to make a scene. Not to get emotional. Through the gloves Lana had insisted she wear, Annette felt Steve’s fingertips on her hand. They were cold. Or maybe it was her own skin that was cold. Focused on Steve’s face, she watched the man she loved disappear behind the Corbett Code. She turned, half kicking the full skirt—another Lana choice she hated—out of her way, and escaped through a door to the minister’s office. She dragged at the engagement ring. The glove blocked her. Yanking at it, she heard a rip, felt material release as she pulled it off inside out. She dropped the glove, then ring—so much easier to remove—on the desk. She had the exterior door open when she turned at a sound behind her. Just inside the opposite entry, Steve had stopped midstride, gaze locked on the discarded glove and ring. She kept going. The door closed behind her with a solid thud. “I still don’t know why Juney called you, but as long as you’re here let’s get a move on,” Max said. Annette grimaced at her older brother, who appeared determined to break the sound barrier with his exit from the hospital. Talking to the doctor who had treated Max’s broken wrist had eased Annette’s worst fears, although it was too soon to rule out nerve damage. The cut on his head was closed and expected to heal well. The next big hurdle was getting him home. After that would come hog-tying him so he’d obey the doctor’s instructions. Then she’d work on how to keep the small construction business he’d built, over years of achingly hard work, running while he was recuperating and his office manager was on a month-long honeymoon on Maui, a trip of a lifetime she’d won in a contest. “I maintained a safe and reasonable speed.” Her prim tone drew a slight grin from Max. Or maybe that was a grimace as he shifted to the edge of the examining table. She truly hadn’t broken the speed limit by much. But she might have set a record for filling a suitcase after Juney called the suburban Chicago townhouse where she, her best friend/business partner, and their company all resided. Annette had repeated Suz’s warning to herself every time the urgency to get to Max had pushed her foot down on the accelerator. Thank heavens balmy weather had cleared the vestiges of a recent snowstorm. She didn’t care if March went out as a lion as long as it stayed lamblike until she got Max situated. She pointed to the cast extending from the top of his fingers to mid upper-arm. When she’d first seen that proof of his injury, along with the unfamiliar pallor of his face against dark hair so like her own, she’d felt as if the floor had tilted. No, she’d closed off those memories years ago. No opening them now, just because she was back in Tobias. Taking care of Max, that’s what she would concentrate on. “Suz is more than capable of taking care of that,” she said. She and Suz had found success matching busy professionals with the perfect service provider, everything from car repairs to lawn work to remodeling. They did the researching, finding, assessing, reviewing, and overseeing. Terrific word of mouth drove business, catching the eye of a corporation that wanted to open franchises offering similar services. The corporation’s buyout offer would set them both up for life. Still, it would be strange to not have the business to occupy most of her waking—and some of her sleeping—hours. Annette snagged Max’s blood-stained work shirt before he could. But when she held it so he could slip his left arm into the sleeve, he scowled so fiercely that she relinquished it. The only way Maximilian Augusto Trevetti would believe he needed help was to prove it to himself. She’d mostly stayed well clear of Tobias for more than seven years. On the few occasions she’d been here—for a rare holiday when something kept Max from coming to see her—the visits had been brief and confined to his house. He’d taken a hell of a fall and nothing, not even her overprotective brother himself, would push her out of town until she knew he was all right. After all he’d done for her—even before their mother’s death—keeping his company and life running would constitute a dime’s worth of payback on a gift of millions. Whether he liked it or not. Not was the smart bet. “Let’s get out of here…” he said, returning to his main theme. His face tightened. He had the shirt on his left shoulder, and partway across his back. Putting his left hand over his right shoulder, he tried to grab the collar to pull it up. Too bad. She was sticking around. But she was no fool. You didn’t succeed in business without facing facts. Helping Max heal and run Trevetti Building would mean full immersion into Tobias, Wisconsin, where everyone knew all about her. Including the luscious tidbit that she’d left Steven Worthington Corbett, elder son of Tobias’ founding family, at the altar seven-plus years ago after he’d gotten another woman pregnant. Well, the citizens of Tobias could cluck over the past all they wanted. She’d learned to leave her past in the past in order to face the present and shape the future. God, that sounded pompous. But this time he didn’t stop her from pulling the shirt into place over his right shoulder. His face darkened, but he said nothing as she slipped the top part of the shirt under his cast-covered elbow, then closed the bottom four buttons. She placed his light jacket over his shoulders. He dismissed that with a grunt. She placed her hand on his arm as if to pat him, but really preparing to support him as he eased off the examining table. “Thanks.” From the wryness, she knew he hadn’t missed her precaution. The calm voice had deepened slightly, but she knew it immediately. Knew it in ways and places she wasn’t going to think about. It stopped both her chuckle and Max’s grumbling. Steve Corbett stood directly in front of her. She shouldn’t be so shocked. Had she imagined, like a baby playing Peek-a-Boo, that the Corbett heir apparent had disappeared from Tobias just because she hadn’t seen him on her few trips back? Giving a fine performance as the original immovable object, Steve didn’t budge. Okay, if he wouldn’t move, she should. Answer coolly and go on past him. This first meeting would be over, and with luck, there wouldn’t be another. That snapped her head to her brother. He’d known Steve only through her. He definitely hadn’t wanted them to marry before she’d finished college, though he’d never pointed out how much he’d sacrificed for her to get an education. And, being Max, he’d backed her once she’d decided. After—that was how she thought of it, just after—he’d said she needed to know so she wouldn’t be caught by surprise, then he’d told her the major turning points of Steve’s life. His marriage to Lily, the birth of their daughter, his going to grad school instead of law school as had been expected, the divorce, then Lily’s death in an accident, and his becoming manager of both the town and county of Tobias. She’d figured Max knew these things because everyone in Tobias knew about the Corbetts. There certainly had never been an indication of anything buddylike between him and Steve. Not until now, when it seemed natural to both of them that he’d accept a ride from the man she hadn’t married. “I’m fine,” Max said, not looking at her. Ah. Now she understood his hurry to get out of the hospital. He’d expected Steve to come and he’d been trying to spare her. “I heard different—you didn’t just break your wrist, you did a real number on it. Out of commission for weeks, maybe months.” Steve flicked a look toward her at the final words. She hooked the leather strap of her purse higher onto her shoulder, smiled and cut short her brother’s opinion of the doctors’ timeline. She had to establish a tone, as she would in business. Was that an edge of accusation? He couldn’t possibly fault her for leaving. Under a battered leather jacket, he wore jeans and a faded Chicago Cubs T-shirt that showed he had not lost his swimmer’s build. His straight nose, strong jaw and totally masculine mouth were what people thought of as aristocratic, and what so few aristocrats actually possessed. His thick hair was cut with casual precision. A memory burst full and fresh into her head. The two of them, sitting on the pier in early October. She was a junior in high school, he was a senior. It was more than two years before they’d started dating. He’d still been with Lily then—it wasn’t until that school year ended that he shocked everyone by breaking up the town’s perfect couple. But that one golden day they’d run into each other as she’d left the library. Somehow they’d ended up on the pier eating strawberry licorice and talking. She’d been teasing him about cheering for the Cubs, who had finished yet another season without a whiff of the playoffs. Most of the town pulled for the Brewers. It made more sense to pull for a nearby loser than go out of state for one. He’d said Miss Trudi Bliss, a former teacher and his distant relative, had taught him to appreciate the Cubs, telling him that pulling for an underdog was a test of character. To not give in to cynicism, to not give up hope, to not switch allegiance to this year’s winner, to find value and pleasure in moral victories. She might have started to fall in love with Steve Corbett that Indian Summer day, sitting beside him, watching the trees weep gold and russet leaves into the lake. Falling had been so much easier than clawing her way out. Zach had left in a spate of loud, harsh words aimed at Lana Corbett and the lusty roar of a motorcycle revved to the max. As with so many things during that time, Annette hadn’t asked and Steve hadn’t volunteered an explanation, even when Zach hadn’t returned months later to be his brother’s best man. Still, she was startled to hear he hadn’t returned at all. Max touched her arm and she jolted back to the present. Steve was talking about his daughter, answering her automatic How is she? Lily had been blonde, slender, and sure as a teenager, so unlike Annette, whose dark coloring and curvy build had not helped her youthful insecurities. Neither she nor Steve looked at him. “I was sorry to hear about Lily. About the accident, and her death.” They were the first words she’d spoken during this encounter that sounded natural to her ears, perhaps because they were sincere. She was still surprised at the sorrow she’d felt for the loss of a woman who had never been a friend. Or had the sorrow been for the woman’s child? Losing her mother as a girl was something she understood. “Lily made a lot of mistakes, but in the end she made it so I had Nell, and I’m grateful for that,” Steve said. It was an oddly distant way to describe how he had come to be raising Nell alone. Yet there was nothing distant in his eyes or voice when he spoke of the child. The child he’d created with Lily while he’d been pledged to her. The wraith of long-ago pain wrapped cold around her. She shivered it off. At least one good had come out of the situation. A little girl had a father who loved her. A lot of men would have found another way—an easier way. Not Steve Corbett. She’d hated many tenets of the Corbett creed, but living up to responsibility was one she admired. She gave it a nice edge of finality.